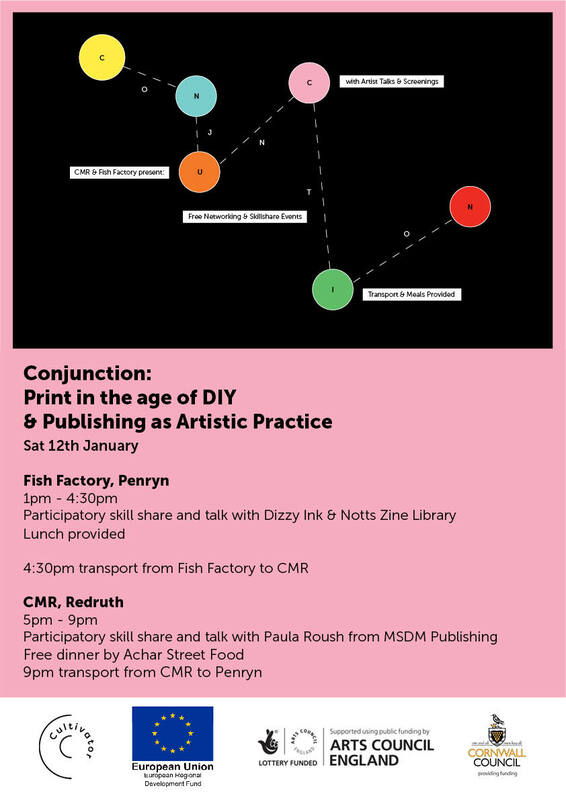 ​Print in the age of DIY & Publishing as Artistic Practice is a Conjunction event from The Fish Factory, Penryn and CMR Project Space, Redruth organised by Alice Mahoney and Rose Hatcher. This day aims to bring together artists and creatives with an interest in print techniques including Riso printing, discussing the DIY punk print scene and zines, as well as artist books, photobooks and publishing as artistic practice. • Mimeograph display and printing. • How to make a zine. • Talk about Mimeograph printing, its history and contemporary Risograph printing from Benjamin at Dizzy Ink. • Talk and showcase from Notts Zine Library. This event aims to open up our print area and other facilities to a new audience. The collaborative element of zine making aims to open up discussion on the subject of the DIY punk print scene, the Cornwall Zine Library (hosted by the Fish Factory) and collaborative practices within the realms of illustration, writing, design, photography and printmaking. Transport provided at 4:30pm to CMR where the event will continue. Talk and presentation with artist Paula Roush, who founded MSDM Publishing and is the curator for ə /uh/ -books: a project space for photobook publishing at the London South Bank University where she also teaches photobook publishing. How do we find ways to bring the productive chaos of artistic practice into the apparently seamless order of the artist’s book? How do we develop a visual language that communicates page after page the content and materiality of artistic research? Each artist will have their own method, and in this seminar, we will look at examples of publishing as artistic practice. Our aim is to analyse some of the ways research and artwork are integrated in ‘democratic multiples’ known as artists’ books. In this seminar, we will discuss varied publishing formats and approaches, and think of one’s studio as a platform for self- publishing. Tools and equipment useful for a ‘do it yourself’ approach are discussed as well as material features of the book that require solutions in the form of double-side printing, separation of the visual material into sections and imposition of the material into layout and sequence. Conjunction is a series of regular artist networking events as a collaboration between Fish Factory and CMR, with skill shares, artist talks, screenings and socials with free dinner and lunch and transport to and from Fish Factory and CMR.